Bummed about this. I like Cabby. Sure wish he didn’t cheat. Things were starting to look up for the Padres. They just took four straight series, including the Yankees here at home, and boom… Everth Cabrera suspended for 50 games. Done for 2013. Didn’t come as too much of a shock, but this’ll hurt the team. Like, a lot. Cabby, as you all know, was the only Padres All-Star this season. 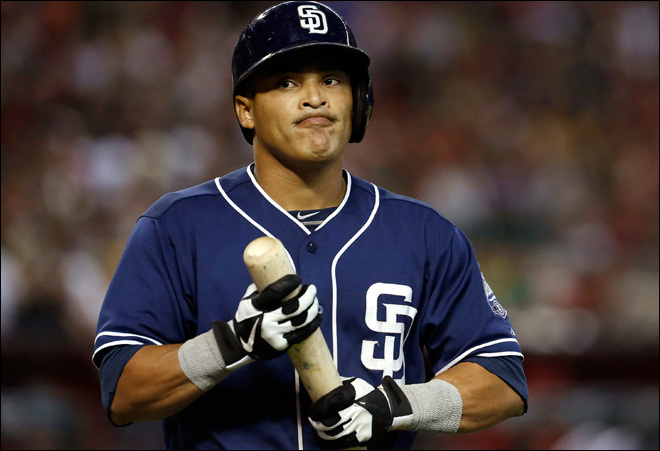 Also suspended from the Padres is some pitcher named Fautino De Los Santos that they claimed off waivers in February. Yasmani Grandal will not serve any additional suspension. The Pads were in 3rd place, 10 games back, in the NL West when the news broke. Kiss any delusional playoff dreams you might’ve had for 2013 goodbye. “They are not worthy of the support of the players’ association. I think the combination of that and somehow having to forfeit or void your contract that you’re under is something that needs to be the main focus of the penalties,” he said. Bold stance to take, Will. I like it. He’s the perfect example of a guy just trying to make it in the Majors. He’s got the cards stacked up against him because he’s fighting for a spot against guys that are on PEDs. Not cool. Good for him. Related: Chargers first pre-season game is Sunday Thursday. This entry was posted in Baseball and tagged Everth Cabrera., Fautino De Los Santos, Padres, padres PED suspensions. Bookmark the permalink.